Frequently-asked questions (and answers) about knob and tube electrical wiring. This article series answers questions about Knob and Tube electrical wiring. We define knob and tube wiring, we include photographs that aid in recognition of this generation of electrical wiring, and we describe both proper and improper K&T wiring installations, repairs, or circuit extensions. This website provides information about a variety of electrical hazards in buildings, with articles focused on the inspection, detection, and reporting of electrical hazards and on proper electrical repair methods for unsafe electrical conditions. 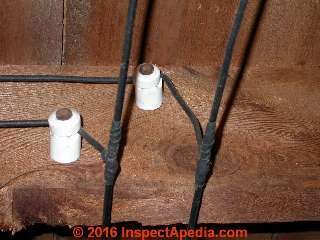 Our page top photo shows a home inspection client pointing out knob and tube electrical wiring in an older home. Knob and tube electrical of wiring has been installed in homes from the 1920s right up into the 1970's in some jurisdictions. The photo shows knob and tube electrical wires passing through a wall top plate in a 1920 New York home. 3. You cannot safely "update" a portion of existing K&T circuit with new wiring if grounding is required, since the feeding K&T circuit would not provide an incoming ground. 5. I would be nervous about doing you are being asked to do. There is NO safe way that you can "test" the safety of existing K&T wiring where it passes through hidden spaces like walls and ceilings. You can do continuity tests and tests for shorts but you cannot see the condition of the wire. For example, where K&T was run originally in an uninsulated wall cavity it might have performed well and safely but decades later after people added insulation by blowing it into the same wall cavity that same wire is now overheating. It is no longer running in open air. So later when someone in an attic plugs in an electric heater and starts a fire in the building walls below where squirrels chewed the insulation off of the wire you and your employer are likely to be blamed. Hi, I work for a company that wants me to replace old Knob and Tube wiring in attics, but I can't find a recommended procedure for safely doing so; tying into the existing K&T in the walls. Do you know where I could find one, as well as a prescribed method of testing the wiring in the walls to make sure it's still safe? You can use the page top or bottom CONTACT link to send us some sharp photos for comment. Also search InpectApedia.com for ANTIQUE ELECTRICAL WIRING to see examples of various types of older wiring. Red & Black would normally be hot wires and white, the neutral wire. class='recent-comment-hdr'>On 2017-02-22 by (mod) - Who can I ask a question about knob and tube wiring? I see you found our email and sent a query - we replied: it's not required to remove or abandon knob and tube wiring (in safe working condition) but you're not allowed to extend those circuits. Who can I ask a question about knob and tube wiring? class='recent-comment-hdr'>On 2016-09-21 by (mod) - is the knob and tube wiring active? I warn about having nearly got fried by assuming a circuit was really "dead" or "off", you want to do a bit more. I've even found live circuits as a building when the main breaker was off, supposedly shutting off all power, and even when the meter was pulled (there was a circuit wired over from an adjoining building). So never assume. Test before touching. 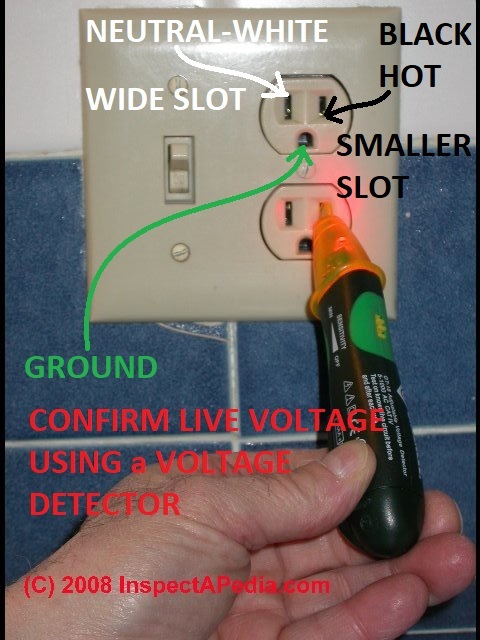 There are several types of voltage detection devices, some inexpensive, that will buzz or light up if held near or touching an electrical wire that carries current. Some of these along with some scary photos are at inspectapedia.com/electric/Electric_Shock_Hazards.php. Hi. I just bought an older house and found a run of knob and tube in the basement. However, the house also has a modern panel of breakers. I painstakingly flipped breakers and checked outlets/fixtures, and determined that every one of them can be turned off in the modern panel. Does that mean that none of the knob and tube wiring I found is currently active? In other words (I guess, being a novice), can knob and tube wiring be connected to a modern panel? Mike - Joyce, this is not good, and if you cannot quickly see what's going on I strongly recommend hiring an experienced electrician to trace down your wiring. From your description, and assuming you correctly identified your main breaker and have only one such in the home and panel, then I suspect your main breaker is defective and did not turn off internally. - you have not correctly identified the main breaker, or in some older panels, there may be multiple "Mains"
- your main breaker is a brand that often fails to actually turn off inside even if the switch is in the "OFF" position, such as FPE Stab-Lok (search our website for Federal Pacific Electric ) for details. - your home has more than one electrical service or (as I have found on some old buildings in very dense urban neighborhoods, usually now used as businesses) on occasion someone has wired one or more circuits in a building by "borrowing" a circuit or power from a neighbor. If on closer inspection your MAIN breaker turns off the light in question, but the individual circuit breaker that you thought controlled that light does not, then either you've not correctly ID'd the individual circuit breaker, or as I described above, the breaker is defective and is not turning off the circuit in question. There are several electrical test instruments that can spot metal running through a wall, including both metal pipes and metal wiring. The trouble with the idea of leaving some bays uninsulated to avoid overheating the K&T wiring is that in walls wiring typically runs horizontally - through most or all stud bays. I'm not sure, other than tracing wiring, how you could reliably infer that wiring in building cavities is the original knob and tube or if some areas have been re-wired. Certainly if you open a junction box and see that there is a ground wire entering the box, or if you see armored cable entering the box, at least right there it's not knob and tube. But we may not know exactly where new circuits were installed and where old ones remain. For example, I would not rely on seeing grounded receptacles as an indication that the wiring is newer than K&T. It's just too easy for someone who is uninformed about good practice to have installed grounded electrical receptacles even though the circuit may not include a ground (and may be knob and tube). In sum: make visual inspection of the entire building to identify where knob and tube wiring is visible, trace those circuts as far as you can into individual rooms; use instruments (such as the Tic Tracer) to trace down wiring paths in walls, ceilings, floors. Thanks, Moderator for your suggestions. I had been told that there was also something that you could plug into the electric panel --then go around the house to see where knob and tube (or at least ungrounded stuff) was. Have you heard of this -- and do you recommend it? MBT there is a variety of circuit tracing tools including what you describe. The simplest is a stand-alone device like the tic tracer by Tif that senses electrical wires in walls; schemes using transmitters also work though where I've seen them used more often it was to track down a specific circuit. Yes, it's a useful approach. Electrical junction box. Let me know (page bottom CONTACT link) what the rest of your teacher's "R" word is. I am in Los Angeles in a house that was built in 1921. It has knob and tube and is still running electricity that way. We've had a licensed electrician come and inspect all the wires, install a brand new breaker box and ground all the outlets. We asked him if cellulose could be blown in over the knob and tube in the attic only and he said that'd be fine because the wires are still in good shape. I called an insulation company with experience in knob and tube and they said it's fine, as well. Especially because cellulose is non-flammeable. I still have reservations, though. A lot of forums say to replace the knob and tube completely. Should I be worried? We are planning on only blowing in the cellulose in the attic, not the walls. Question: is it ok to run romex wire off of a knob and tube circuit? k&t should never be spliced into to extend the circuit. When k&t was around it was used primarily only for lighting and other light load on the wiring. Don't even think of using it for bathrooms, hair dryers, coffee makers, kettles and toasters, etc. With the age of the wiring (splices were taped), the splices are brittle and often deteriorated. Adding a new circuit as illustrated above can be very dangerous, depending on new load added to the circuit. Splices overheat and can be a potential fire hazard. Many insurance companies in Quebec Canada will not insure a home with k&t or charge and insane premium for it. If they do insure it, they demand that the system be inspected by an electrician prior to insuring the home. I believe in Ontario Canada if you have a home with k&t it has to be replaced, they will not insure your home! (Can someone confirm this?). The insurance companies are doing this due the the higher risk of fire with homes that have k&t (statistically). I personally would never add a circuit modify the wiring or cover it with insulation. It can be performing well right now, but the modification can over heat the wiring and cause a fire. I would make a plan to slowly replace the wiring. If insulating an attic replace the wiring, its just safer, why take a chance. Question: how do I get this unsafe knob and tube wiring out of my home? this is a good start, but i know what k&t is and that i should get that old fire hazard out of my home! this is not easy for the pro's but not ever one can pay there hard cash but they know its only a matter of time with k&t for the elc. doing one line at a time once i run in to a splice wire "soldered and also taped" i will put a box in. hope i am doing things right! If old electrical circuits are found to be damaged or otherwise unsafe and beyond economical repair, most folks just disconnect the old wiring and leave it in place- harmless in that case. Old wires are capped, enclosed in junction boxes and labelled as "OFF" or "DEAD" or "DO NOT USE". Plan the runs by careful study of building layout and the directions of floor and ceiling joists as well. Wires are snaked through wall, floor, ceiling cavities using a few holes to give access, and drilling, and fish tapes. Check with your building department to see what permits and approvals are needs, and what work requires a licensed electrician. Some electricians will also allow you to do certain tasks that will cut your costs. Requirements for permits, approvals, licenses are not just tonirritate you, they are to keep you, your family, and future occupants of the building safe. I was trying to instal a microwave and our knob and tube wiring (black and white wires) crossed and there was a big pop and bright light and now nothing on that circuit works. I thought I was turning off the right breaker but Im guessing it wasn't the right one. How can I fix it? Bailey: it sounds as if you either crossed a hot to ground or moved a wire with damaged insulation so that a hot lead shorted to ground. Turn off and leave off the circuit until your electrician has diagnosed and fixed the problem. Proceeding as you describe sounds dangerous, risking shock or fire. Question: ok to use a compressor, refrigerator or computer on a Knob and tube circuit that has been extended? Is it unsafe to use compressors, refrigerators, computers, etc with knob and tube wiring that has been extended with three wire insulated wiring in an old building built in the 1920's and used as a fire station? Reply: extending K&T circuits is unsafe; also you're missing a required ground. The wiring you describe is unsafe and probably violates electrical codes in that while it is permitted to continue to use K&T wiring that is in good condition, extensions and additions to the circuit are not permitted. And computers or other devices that are sold with a grounded electrical plug at the end of their power cord must be connected to an electrical circuit in which an electrical ground is provided - a feature not included with knob and tube wiring. the lights in my second floor house which are K and T go off when it is cold in the middle of night and back on when the house heats up in the day . Diego: look for a loose or corroded electrical connection at one or more splices in the circuit, starting at the panel and working forward. OR when lights are "off" trace the circuit to see if part of it is live as the fault lies at the end of that run. Question: adding a bath fan and switch to a knob and tube circuit: which is the hot wire? Sorry for the bad news, but while it's legal to continue to leave in place and use existing knob and tube electrical wiring, it is not acceptable nor permitted to extend or add to those circuits. Question: does knob and tube wiring that was wet need to be replaced? If K&T wiring gets wet, can it be dried out or does it need to be replaced? You can read about wet electrical wiring hazards in documents that address flood damage to homes. Generally if wiring has been wet there may be shock and fire hazards. Usual procedure is to have the wiring inspected by a professional. The wiring does not necessarily have to be replaced. However with old, fabric-covered wire such as was often used with knob and tube systems, the inspector might opine that the insulation has been caused to deteriorate so might want wiring replaced. Watch out: As the Underwriters Labs point out in their flood advice, "... this is not a do-it-yourself project"
Leave electrical power off and don't even touch the electrical panel until an electrician has inspected the system and let you know that it's safe to do so. You don't say just what sort of "wetting" occurred nor its extent. After building flooding, it is common to have to replace electrical circuit breakers, fuses, switches, receptacles, and even wiring as well as electrical equipment such as motors that were flooded or soaked. On the other hand, if someone opened a can of carbonated water and accidentally splashed a section of K&T wiring, most likely it'll be ok. If splices are soldered, then they are safe. A properly soldered splice is safer than any wire nut or quick connector made today (those are dangerous). IF K&T is 12 gauge, it can definitely be used for heating appliances, if all of it is 12 gauge. I'd trust K&T over old crumbly Romex, where both wires are right next to eachother. That stuff is scary. Ungrounded wiring is only dangerous if you try to use grounded appliances, or otherwise appliances with conductive housings that aren't properly insulated (lamp sockets, where the paper gets damp in the summer, or crumbles). 2. damaged wiring from being exposed to rodents, foot traffic etc. 3. change in wire conditions that mean overheating, such as the addition of insulation to building cavities where the wire was originally installed in open air space. 4. 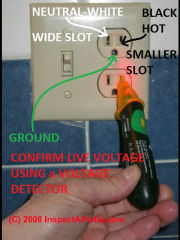 Connection of "grounded" receptacles to un-grounded circuits, which is unsafe and in most jurisdictions a code violation. I emphasize the term "receptacle" or in popular parlance "wall plug or wall socket" - the existence of a wall receptacle with a ground opening when wired to an ungrounded circuit is unsafe and illegal: we cannot control who may come along later and connect to it a device that presumes the presence of an electrical ground connection for its safety. Question: cover up knob and tube to improve safety? Why can't an insulation barrier be made out of non-conductive, heat resistant material, perforated with ventilation holes that can be attached to a joist and covers k&t wiring, allowing insulation to be inserted in the joist bay but along side of the dam and away from the wiring that remains cooled from the perforations in the top of the shielding? A material that is inexpensive, easy to cut to different lengths & fast to install (a 10' long piece that can be screwed or nailed to the top of a joist, extends out just far enough to surround the k&t wiring and rests on top of the gypsum/sheetrock/plaster ceiling of the room below so that a 12" piece of insulation can be covering the 16" joist bay between the shielding and the adjacent joist.) At least in this manner you can still insulate a majority of your attic while keeping the insulation away from the k&t wiring. You could insulate the stud or joist or other framing bays through which no wiring is run. Insulating around wiring, if it's close enough to raise the wiring temperature, will raise the issues of heat deterioration of the insulation and a resultant fire risk. What's missing is the beef of your suggestion and also of my reply, that is, we don't know the clearance distance that would in all circumstances (building variations, weather, temperature, air movement, current flow) would keep the wiring temperature within its rated temperature range. Question: I have 35 volts from hot to neutral. I have 35 volts from hot to neutral. I suggest you need an electrician to find where someone has crossed wires - not to be a smartypants - but a mistake can kill you or burn down the house. When you see voltage to neutral if nothing is connect to or running or drawing current on the circuit then you have a short somewhere in the wiring. I have an old home with knob and tube that has been inspected and rated as "in remarkable good shape, the best I've ever seen" as the inspector. The box in the basement is new, the basement and kitchen has been updated and into the new box. In the entrance we went to replace a chandelier that was working perfectly-just wanted a different style. When we put up the replacement it blew a fuse. We tried everything and kept blowing the fuse, so we took another light that we had use before and went to hang it instead and blew the fuse. Both chandeliers after blew a circuit breaker when tested at another hookup/outlet. My question is this-it could be possible both lights I went to hang were bad because they had both been used in other applications but now I'm afraid to hang anything! How do I test to make sure it's not the wiring in the ceiling where I was trying to hang it. I really don't want to start ripping the ceiling down to trace it when the previous light worker perfectly there for years. Reply: This scares me, really. Your inspector sure makes me scared, Dan. Any inspector who sounds as if he is giving a sales pitch for the home makes me worry that he's working for the seller or realtor, not for the client who's paying him. That in turn makes me worry that hazards may be under-reported or mis-reported - putting the buyer at risk of a nasty surprise later. That editorial finished, knob and tube wiring in good condition is not required to be replaced, though it cannot be extended, and it is less safe than modern wiring in that there is no electrical ground on the circuit. When you put up your replacement light fixture and a fuse blew, that suggests that there is a wiring error - a short circuit somewhere is most likely. It's easy to have a sneaky, hard-to-find short when working on older wiring: a connector made too tight that cuts into a wire's insulation at a metal box, or a wiring error during hookup can be the cause. Keep in mind that your light is not grounded - so an error that connects power to the metal of the light fixture presents a serious shock hazard. Then review the installation connections and try again. Question: can I assume the knob and tube wiring in this home is all inactive or "off"
Also See SAFETY for ELECTRICAL INSPECTORS for a more complete treatment of electrical inspection safety procedures for inspectors. Continue reading at KNOB & TUBE WIRING or select a topic from closely-related articles below, or see our complete INDEX to RELATED ARTICLES below. 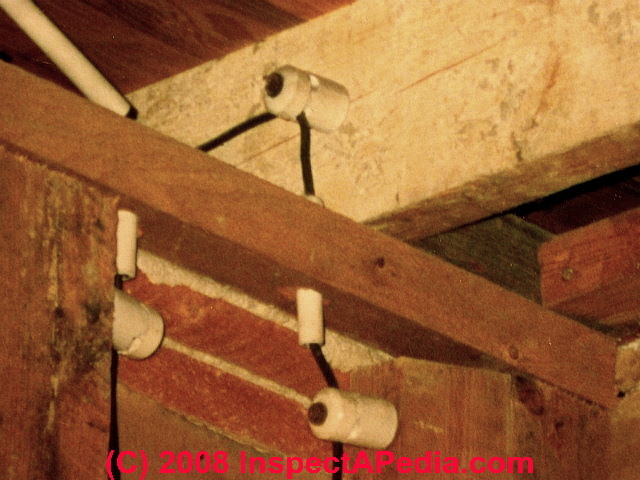 KNOB & TUBE WIRING FAQs at InspectApedia.com - online encyclopedia of building & environmental inspection, testing, diagnosis, repair, & problem prevention advice. Questions & answers or comments about knob and tube wiring: inspection, detection, & repair advice. Use the "Click to Show or Hide FAQs" link just above to see recently-posted questions, comments, replies, try the search box just below, or if you prefer, post a question or comment in the Comments box below and we will respond promptly.